Researchers use ‘demethylating’ precision medicine to fight cancer. A main barrier to immune therapy success has been the tumour’s ability to keep the immune system from functioning against the cancer. The immune cells are there, however, like an unarmed army, they hang around and do nothing. However, certain epigenetic processes that silence such viral defense genes can be reversed in tumour cells with a demethylating drug, making immunotherapies work more effectively to kill cancer cells. Now, a study from researchers at the Johns Hopkins Kimmel Cancer Center, University-Clinic Erlangen, Memorial Sloan Kettering, Case Western Reserve University and UCLA has identified a core group of genes related to both a viral defense warning system and susceptibility to a demethylating drug called 5-azacytidine that chemically alters their ability to operate through a process called demethylation. The opensource study is published in the journal Cell. Previous studies show that tumours are known to co-opt cellular gene-silencing systems that add tiny chemicals called methyl groups to areas of genes, thereby turning off the affected gene function. Such epigenetic control normally occurs in many genes, including ones that contain DNA leftover from previous exposures to viruses. When epigenetic control of these genes is removed, the virus-laden gene sequences are activated and trigger an alert to immune system cells that a virus has invaded. In earlier studies with human cancer cell lines and mice, researchers at the Johns Hopkins Kimmel Cancer Center and others from the global medical community have found a way to trigger a type of immune system ‘virus alert’ that may one day boost cancer patients’ response to immunotherapy drugs. An increasingly promising focus of cancer research, the drugs are designed to disarm cancer cells’ ability to avoid detection and destruction by the immune system. The team would also like to note a study with similar findings from the Ontario Cancer Institute and the Van Andel Institute focused on the ability of DNA demethylating agents to target colorectal cancer stem cells which is published in the same journal. The current study worked with laboratory-grown cell lines from human ovarian, colon and skin cancer. In the cancer cell lines data findings showed that the viral defense pathway can be turned on when the cells were exposed to 5-azacytidine. Results showed that once the pathway is activated the tumour cells release signaling proteins called interferons that rouse other cancer-fighting cells in the immune system. The team then developed a gene signature of the viral defense pathway. In tumour samples available from the National Cancer Institute’s Cancer Genome Atlas project, the scientists used the gene signature to distinguish between tumour samples with high expression of the pathway from those with low expression. Findings showed that those with high expression may respond to certain immunotherapy drugs without the aid of 5-azacytidine and those with low expression levels may need the epigenetic drug to boost response to immunotherapy. Looking for the connection between the pathway’s expression and immunotherapy drug response the lab focused on expression levels of the viral defense pathway in tumour cells from 21 patients with melanoma treated with the immune therapy drug ipilimumab. The current study found high expression levels in the cells of seven of eight of those patients who had responded well to ipilimumab. Results also showed that cells from all 12 patients with limited response to ipilimumab had low expression of the viral defense pathway. The group also validated this finding in a melanoma mouse model in which ipilimumab alone was partially effective, showing that once 5-azacytidine was added to ipilimumab there was a better tumour response. The team conclude that treatment with 5-azacytidine activates interferon signaling in tumour cells and, when followed by an immunotherapy called checkpoint blockade, which lower cancer cells’ defenses and allow immune system cells to see and destroy them; the immune cells could go into increased action against the cancer. The team note that clinical trials will take time to learn how effective the strategy of alerting the viral defense pathway might be. However, they go on to surmise that the strategy holds promise for patients who have cancers with low expression of the pathway. For the future the lab plan to validate their findings in clinical trials. 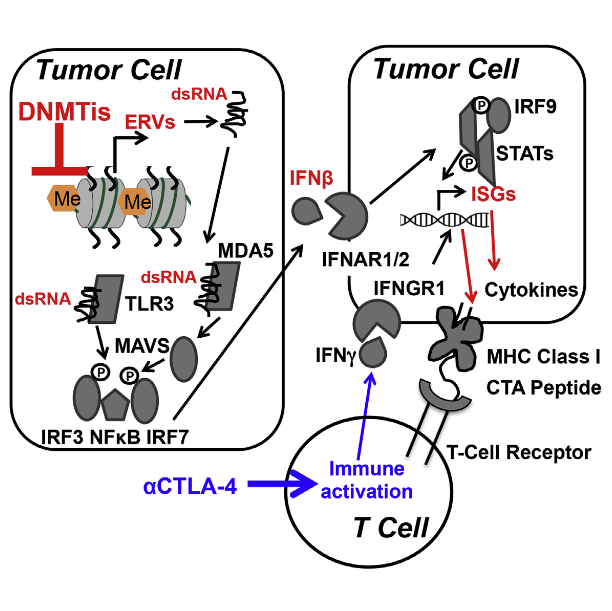 We show that DNA methyltransferase inhibitors (DNMTis) upregulate immune signaling in cancer through the viral defense pathway. In ovarian cancer (OC), DNMTis trigger cytosolic sensing of double-stranded RNA (dsRNA) causing a type I interferon response and apoptosis. Knocking down dsRNA sensors TLR3 and MAVS reduces this response 2-fold and blocking interferon beta or its receptor abrogates it. Upregulation of hypermethylated endogenous retrovirus (ERV) genes accompanies the response and ERV overexpression activates the response. Basal levels of ERV and viral defense gene expression significantly correlate in primary OC and the latter signature separates primary samples for multiple tumor types from The Cancer Genome Atlas into low versus high expression groups. In melanoma patients treated with an immune checkpoint therapy, high viral defense signature expression in tumors significantly associates with durable clinical response and DNMTi treatment sensitizes to anti-CTLA4 therapy in a pre-clinical melanoma model. Inhibiting DNA Methylation Causes an Interferon Response in Cancer via dsRNA Including Endogenous Retroviruses. Strick et al 2015. FDA clears the world's first test to identify five yeast pathogens directly from blood. Previously unknown tau pathway leading to Alzheimer's disease identified.